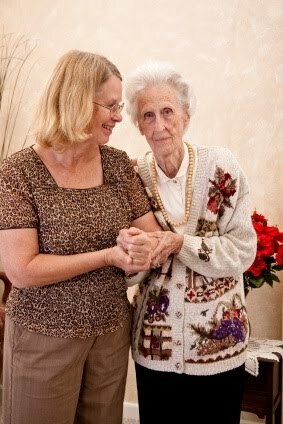 We've blogged previously about the silent long term care system of informal caregivers in the US. These are the families and friends who provide the bulk of care for older adults in the US. The National Caregiving Alliance estimates that nearly 1/3 of US aldults are caregivers. This caregiving is seemingly "free" - it appears to cost the US Healthcare System nothing. Often, however, this work comes at great cost to the caregivers, including higher rates of depression and other health effects. It also means the caregiver is providing care, and not earning an income for themselves or their family. Today we have more information about the economic costs of informal caregiving in the US. They estimate the cost of informal elder care at $522 billion annually. That is, had these caregivers been working instead of providing care for "free", they would have made $522 billion. The costs of formal long term care (e.g. nursing home care) are less than half the costs of informal care - $221 billion annually vs. $522 billion annually. The estimated costs of replacing informal caregivers with paid unskilled caregivers is $221 billion, and replacing informal caregivers with skilled caregivers is $642 billion. Conclusion: the informal caregiving system is more affordable than replacing this system with a skilled care system. These estimates may be underestimates because they do not include the cost impacts of caregiving on the emotional and physical health of the caregiver. Why is this information important? Policy initiatives are just starting to recognize the importance of informal care. Many states offer Medicaid's Cash and Counseling Program to reimburse caregivers for low income and/or Medicaid eligible seniors. This program is in an early, pilot phase, however, and risks budget cuts at the State and Federal level. We need more support for this program. And the monetary recognition of the sacrifices made by informal family caregivers addresses just one small aspect of the problem. Better training for this work is essential. Informal family caregivers are often untrained and unprepared, working in isolation for years on end. Time our country started listening. This is a big problem. As the ratio of people working to people not working (termed the dependency ratio) goes from ~4 to <3 in the next 30-40 years, this problem will grow even further. We absolutely need to figure out how to provide better training. Aside from monetary rewards for the work which I worry might not be sustainable, I think training, support, and respite might be more innovative ways to spend the pennies that states are allocating for this work. Just to add one nuance. We often talk about the cost to caregivers in terms of health effects and depression as those are measurable truths. I wonder if there are unmeasurable altruistic benefits. While caregiving can be extremely difficult, there are also few things one can do that are more altruistic which may have benefits for the other aspects of the caregiver's soul. Also, while I don't pretend to know why we're all here on earth, I wonder if learning to deal with challenge after challenge is one of our major tasks and perhaps caregiving is one of those challenges...(okay, that last part may have gotten too philosophical - I'll stop before I embarrass myself). Im sorry, this is typical western mentality to put a dollar amount on care. This is a responsibility. . Its like saying what the cost of taking care of your children or spouse is. Now, distant relatives and their care by extended family is another thing. Hope that the Aging Network is paying attention - Lots of healthcare system transformation depends on migrating postacute care to the community and home. Time for all the nonprofits involved in family caregiving and aging advocacy started to make more noise about these issues, compounded by the design flaws of assistive equipment that is supposed to help with transfer/lifting assistance, a focus on self-managing devices! I am a nurse and parent of a 23 year old son who has been disabled since birth. We have cared for him at home and I have followed Geri-Pal with great interest because we and he experience many of the same issues of "elder care." While the numeric age is different, the care needs heavily overlap. I cannot help but think that if we could combine our strengths and perspectives, we could be a larger, more coherent voice. Together we would benefit those for whom we care far more than we can do alone. Yes, if there were more societal support for caring, people could more easily appreciate the positive experience it can be.